at the Brooks Institute Screening Room in Ventura. All ages welcome! When does jewelry become art? Is important jewelry made only with precious metals and gems? How does jewelry transform the wearer? These and other questions will be explored as Mary Galbraith visits with Jo Ellen Lee and Elaine Unzicker. Jo Ellen earned a Ph.D. in Medical Genetics and worked for many years in genetics laboratories in the southwest. She took up beading in 1993 and it was soon evident that her precise, careful work and superb color sense took her beaded art pieces and jewelry to high levels of excellence. Elaine, a member of the Ojai Studio Artists, holds a BFA, MFA and Master of Science in Art. Her specialty is working with chain mail, a material that is tantalizingly soft and hard at the same time. 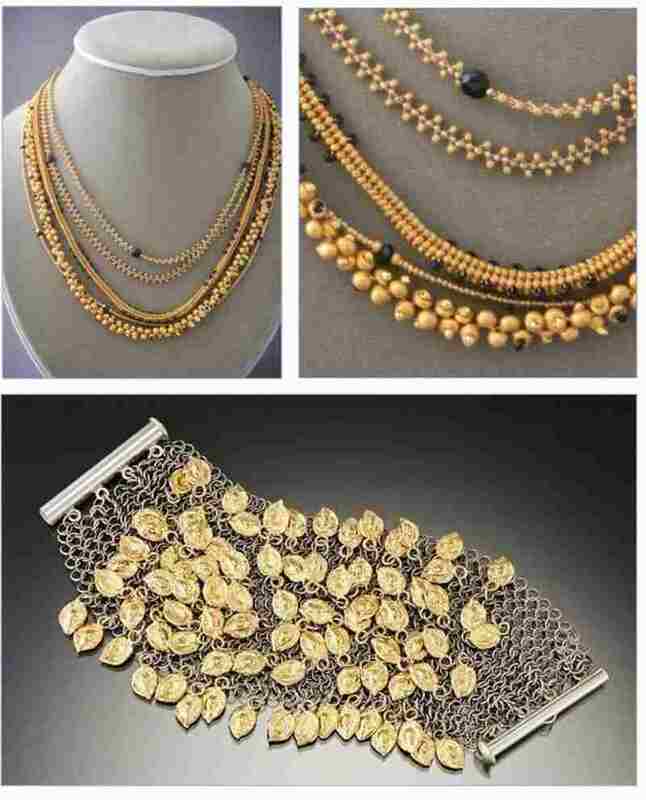 Traditional jewelry pieces such as earrings, chokers, and bracelets form but a part of her work. The clothing pieces she designs are truly wearable art: unique, stylish and definitely cool (in all senses). Mary is a long-time volunteer with Focus on the Masters and a devoted wearer of jewelry. Please join us. Free to FOTM Members – $10 General public – $5 students and seniors. Join us for a celebratory supper prepared by Old Broads Catering Company immediately following the interview at the FOTM Archive & Library, 505 Poli Street, Suite 405, Ventura. Maps will be given to paid guests at the interview. The AfterGLOW is $25 for FOTM members, $35 for non-members. Paid reservations are essential & required prior to January 29 for the AfterGLOW. Valentine’s Day follows on the hells of this program. To make it easy for lover to please their lovers, a limited number of jewelry items will be available for sale.